Shinagawa (品川) is one of the 23 wards of central Tokyo, and is also a major railway station in south-central Tokyo. Historically, parts of this ward were known as Shimazuyama. Many feudal lords (daimyo) maintained estates in this area during the Tokugawa Shogunate. More recently, this area is the birthplace and former home of Sony. Today, Shinagawa is a central train hub for Tokyo, possibly second only to Tokyo Station itself in the number of trains you can catch here. It is also a center of "European" style businesses and tourism, so you will see more English than Japanese on signs, and more Italian and American restaurants than Japanese ones. 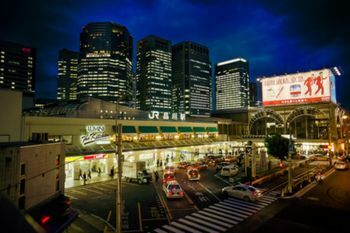 Although Shinagawa is a ward of Tokyo, Shinagawa Station is actually in the ward of Minato: Shinagawa Ward is located to the southwest of Shinagawa Station, in the area surrounding Gotanda and Osaki on the Yamanote Line. The two sides of Shinagawa Station are quite different: the west or "Takanawa" side is mainly residential, with the exception of a sizeable hotel zoning immediately around the station. The east side or "Konan" side ranges from commercial to industrial, although many new modern residential apartments have been developed near the station and along its many water canals. Because of the large number of railway lines passing through, it is difficult to get from one side of the station to the other without walking through the station itself, so be sure to exit the station on the correct side for your destination. Shinagawa Station is served by Japan Railways (JR) and Keikyu Railway. JR runs trains to Shinagawa on the Yamanote, Keihin-Tohoku, Yokosuka, and Tokaido lines. Most Narita Expresses from Narita Airport travel directly to Shinagawa (75 min., ¥3,190). Shinagawa Station is also served by the Tokaido Shinkansen, making this a convenient jumping-off point for trips to Kyoto, Osaka and other cities along the line. On the Yamanote line, Ōsaki and Gotanda stations are also in the area. Keikyu Railways trains run south to Haneda Airport, Yokohama and points beyond. Keikyu also has through service with the Asakusa subway line and operates trains going as far north as Narita, making this a cheap, but much slower, alternative to the Narita Express. The trip between Shinagawa and Haneda Airport takes as little as 17 minutes and costs ¥400. Directly across the street from JR Shinagawa Station Takanawa Exit you will find Enoteca on the second level of Shinagawa Wing. Shop for imported wines, or sample glasses in their small cafe. The Wing also has a tea shop. With the new Shinkansen service to Shinagawa, the area hotels have become much more convenient (and crowded). Rooms at the hotels near the station sell out very quickly. Try Gotanda Station, 2 stops away on the Yamanote Line, for cheaper business hotels or capsules. This page was last edited on 29 August 2017, at 09:08.